Go beyond the traditional laptop with Surface Laptop. It's backed by the best of Microsoft, including Windows, and delivers a natural typing experience enhanced by our signature Alcantara material-covered keyboard. Thin, light and powerful, it fits easily in your bag. A single sign-on gives your business access to cloud-based company resources through Azure AD. It lets you use a cloud-based device management solution and gives you business access to LOB Apps through the Windows Store for Business. Surface Laptop complements your personal style with its blend of texture, subtle details and clean lines. Feel the luxurious touch of our Alcantara covered keyboard. The soft, durable fabric is created to easily wipe clean and offers a comfortable typing experience. At just 2.76 pounds, Surface Laptop fits easily in your bag, provides all-day battery life6 and has a powerful Intel Core processor to handle demanding desktop programs. Enjoy Dolby Audio Premium sound without added bulk or speaker grilles thanks to built-in Omnisonic speakers. Experience faster, easier, more natural navigation—with razor-sharp resolution for photographs, videos and presentations—on the vibrant 13.5-inch PixelSense Display with touchscreen. Enjoy more space for your ideas with an edge-to-edge display and ultra-thin bezel. 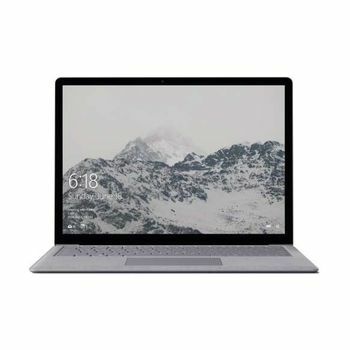 Description • Luxurious Alcantara material-covered keyboard • Ultra-thin and light laptop fits easily in your bag • Breeze through tasks with a powerful Intel Core processor • Up to 14.5 hours of video playback⁴ • Designed for Windows 10 S² Performance made personal Go beyond the traditional laptop with Surface Laptop. 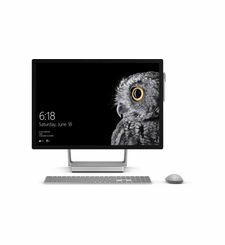 It's backed by the best of Microsoft, including Windows, and delivers a natural typing experience enhanced by our signature Alcantara material-covered keyboard. Thin, light and powerful, it fits easily in your bag. Cloud convenience plus the power of apps A single sign-on gives your business access to cloud-based company resources through Azure AD. It lets you use a cloud-based device management solution and gives you business access to LOB Apps through the Windows Store for Business. Beautifully designed and crafted Surface Laptop complements your personal style with its blend of texture, subtle details and clean lines. Feel the luxurious touch of our Alcantara covered keyboard. The soft, durable fabric is created to easily wipe clean and offers a comfortable typing experience. The perfect balance of portability and performance At just 2.76 pounds, Surface Laptop fits easily in your bag, provides all-day battery life6 and has a powerful Intel Core processor to handle demanding desktop programs. Enjoy Dolby Audio Premium sound without added bulk or speaker grilles thanks to built-in Omnisonic speakers. A stunning screen that responds to your touch Experience faster, easier, more natural navigation—with razor-sharp resolution for photographs, videos and presentations—on the vibrant 13.5-inch PixelSense Display with touchscreen. Enjoy more space for your ideas with an edge-to-edge display and ultra-thin bezel.